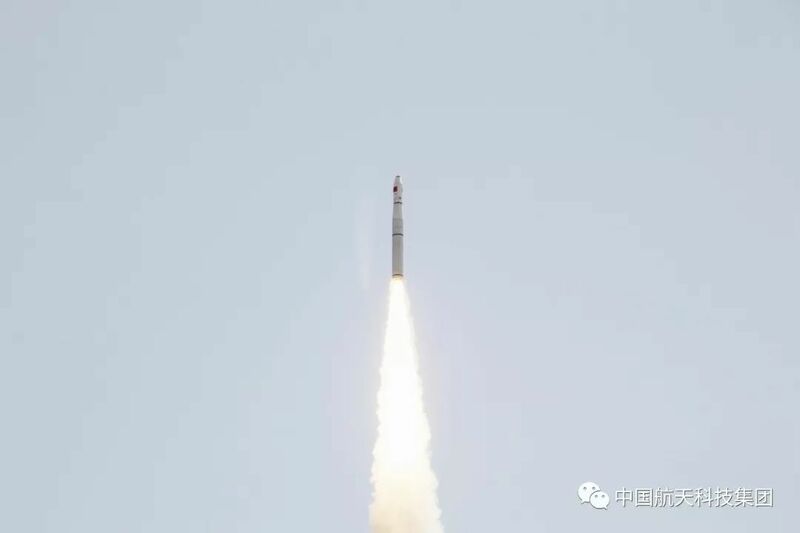 A Chinese, all-solid-fueled Long March 11 rocket packed with five Earth-imaging satellites lifted off from the country’s Jiuquan Satellite Launch Center at 4:42 UTC on Thursday. Hidden under the rocket’s payload fairing was the second group of commercial imaging satellites for operator Zhuhai Orbita Control Engineering Ltd., designated OVS-2A and OHS-2A through 2D – joining a growing constellation of multi-instrumented satellites to provide data for various applications including such not possible with conventional Earth observation products like still imagery. Thursday’s launch took place at 4:42 UTC when the 21-meter tall Long March 11 rocket shot up from its above-ground launch tube set up at the Jiuquan Satellite Launch Center. 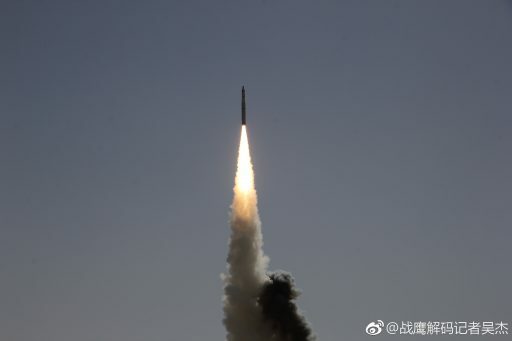 The Chinese did not immediately acknowledge the launch through the usual channels, though an unofficial confirmation that the launch had been successful came forward through Chinese social media around 45 minutes after liftoff. The Chinese Academy of Launch Vehicle Technology confirmed launch success around two hours after the event and orbital tracking data collected by the U.S. will provide an independent confirmation later on Thursday. Thursday’s launch marked the 12th Chinese orbital space launch of the year and the 39th worldwide in 2018. For the Long March 11 rocket, it was the fourth overall launch since its debut in 2015 and the second of 2018 as the vehicle transitions from its demonstration phase into operational missions with another two or three flights still on the manifest for this year. Packed under the fairing of Long March 11 were five stacked Zhuhai remote sensing satellites joining a growing constellation of commercial satellites. Operated by Zhuhai Orbita Control Engineering Ltd., the initial constellation is known as Zhuhai-1 or Orbita and comprises three different satellite types: high-resolution video satellites (OVS), hyperspectral satellites (OHS) and small personal satellites (OPS). The first two satellites, OVS-1 01 and 02 also known as Zhuhai-1 01 and 02, were launched in June 2017 as secondary payloads on the Long March 4B mission that lifted China’s Hard X-Ray Modulation Telescope. According to the company, Thursday’s launch lifted one high-resolution video satellite (OVS-2A) and four hyperspectral-imaging satellites (OHS-2A through 2D) in a configuration that had two OHS satellites ride side-by-side with OVS-2A, taking up a larger space, sitting in the primary position atop the dispenser. Information published before the launch indicated OHS-2A was also named Qingkeda 1 and OHS-2C carried the name Guiyang 1, likely named after institutional participants or sponsors of the project. Whether the other two satellites also carry such names was not known at the time of Thursday’s launch. 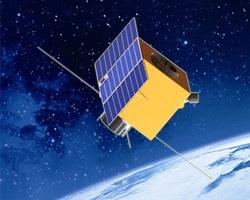 The OVS satellites building the video component of the Zhuhai-1 constellation are tasked with the collection of 20/25-frame-per-second, high-resolution video of targets on Earth, capable of keeping a target in view for up to two minutes by slewing to compensate for their orbital motion. Unlike still-imaging satellites, video acquisition can be used to reveal phenomena on the ground that are in motion – making such data products useful for analysis of traffic and studying other activity that occurs at rapid progression. OVS-2A is understood to be an improved version of the prototype OVS-1 satellites, featuring a number of obvious changes like a larger telescope and solar baffle, operating at a higher optical resolution than the initial satellites which were to capture video at a ground resolution of 1.98 meters. 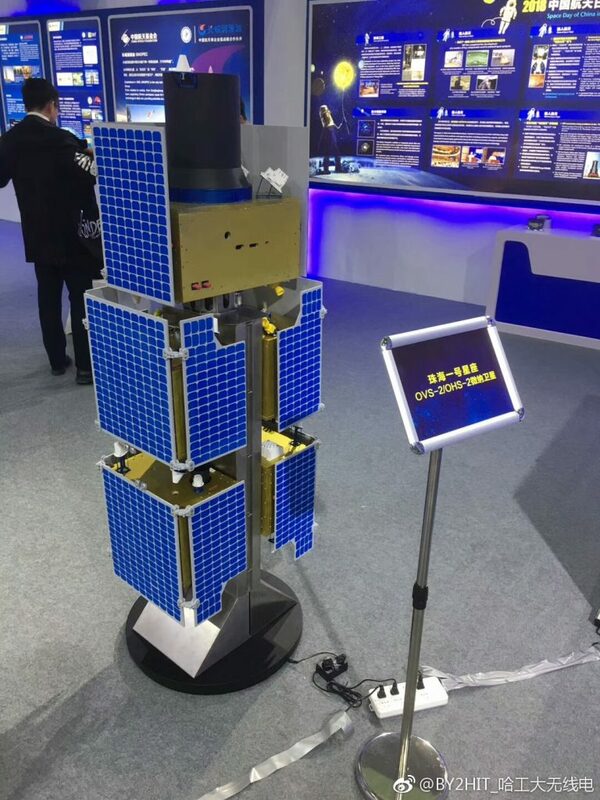 According to information published by Zhuhai in 2016, the OVS-2 satellites weigh between 80 and 100 Kilograms and host a three-panel solar array delivering 100 to 180 Watts of power to the satellite. The imaging system captures 25fps video of a 3.6 x 2.7-Kilometer scene on the ground with a resolution of 0.9 meters; the typical length of video collected of one ground target will be 120 seconds as the satellite compensates for its orbital motion. Data is stored in an onboard memory of 2048 GB and downlinked to the ground through a high-speed link of 300 Mbps. The hyperspectral segment of the constellation appears to have foregone the launch of a prototype first generation satellite. 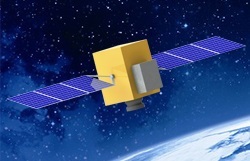 According to Zhuhai, the OHS-2 satellites also weigh between 80 and 100 Kilograms and employ similar power-generation and data handling systems as their optical counterparts. The instrument payload captures data across a 140-Kilometer wide ground swath at an image resolution of five meters in a number of spectral channels spanning 350 to 1,100 nanometers. Four OHS satellites, spaced appropriately in their orbital plane, can provide a global revisit time of five days. 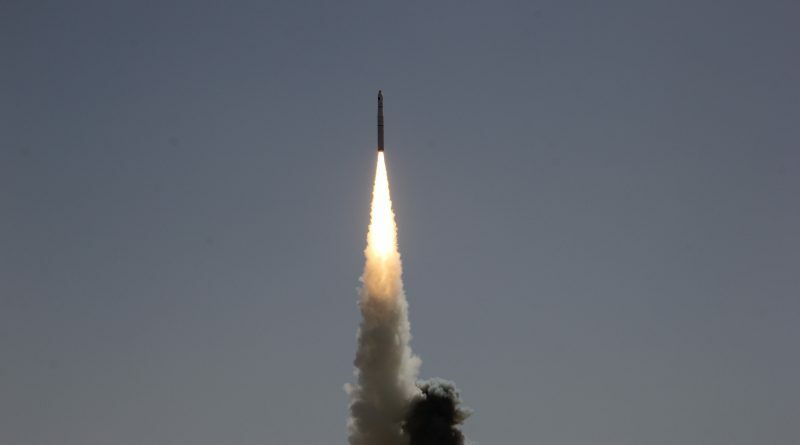 For Long March 11, Thursday’s mission marked its fourth launch after its debut mission in 2015 with four small satellites, a second launch in November 2016 with the XPNAV Pulsar Navigation Satellite and six secondary payloads, and a third launch earlier this year that lifted a pair of Jilin video satellites and four secondary payloads. Developed by the China Academy of Launch Vehicle Technology (CALT), Long March 11 represents a quick-reaction launch vehicle that can be kept in storage for an extended period of time and readied for liftoff on short notice, even in a matter of hours. This, of course, could be relevant for quick response missions by the military to position a satellite where it is needed, when it is needed but it also comes with potential in the commercial sector by offering a launch-on-demand capability with very short procurement lead times for medium-lift missions into desired orbital regimes by remote sensing missions and Low Earth Orbit communications constellations. Long March 11 is a four-stage launch vehicle standing 20.8 meters tall, 2.0 meters in diameter and weighing in at approximately 60 metric tons. The vehicle has a liftoff thrust of 120 metric ton-force and is optimized for Low Earth Orbit Missions which typically involve the vehicle firing its first three stages in close succession ahead of a coast phase to allow the fourth stage to inject satellites into circular orbits. The rocket’s first stage is the largest Solid Rocket Motor developed in China, likely drawing heritage from the country’s ballistic missile program. CZ-11 can lift 700 Kilograms into a standard 200-Kilometer orbit, 380kg can be delivered into a standard 700-Kilometer Sun Synchronous Orbit. The launcher can fly with two different payload fairings, 1.6 or 2.0 meters in diameter, to support a variety of payloads. Launching with short prior notice can be particularly useful for military-operated missions that are subject to tight operational requirements as well as disaster response missions of Earth-imaging craft that need to be placed over a given area to deliver timely imagery for the assessment of the extent of a natural disaster. 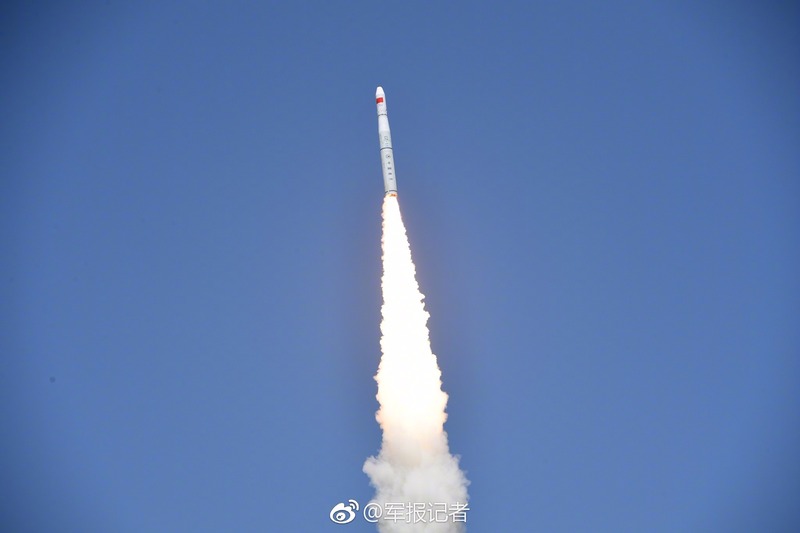 CZ-11 will be operated alongside the Kuaizhou quick-response launch vehicle that is designed for a more generic use with an integrated launcher-spacecraft system.